Engineering expertise developed in the automotive industry is helping solve a major ‘presentation issue’ for the fast-growing vaping industry. RDM Group, which has been a key figure in the evolution of driverless vehicles, has joined forces with Vapouriz to develop a new display case that allows up to 8 different flavours to be tested easily in stores around the country. The innovation comes from a robust ‘retractable’ mechanism that is housed within a plastic shell and avoids messy cabling that customers were getting caught up in. Using the new technique, clients can now test Vape handsets easily and without the safety issues caused by the tangling or the display unit moving around. Store owners can also swap the different e-liquids to suit current and future trends. The deal is worth £160,000 so far to Coventry-based RDM Group, with the potential for this to double over the next 12 months as export orders are confirmed. “It was a bit of a chance meeting at an event when our CEO David Keene got chatting to Vapouriz and they quickly got around to the display issues they were facing,” explained Miles Garner, Sales and Marketing Director at RDM Group. RDM’s design was an instant success and has so far been installed in more than 100 different Vapouriz stockists across the UK. The feedback has been excellent from store owners and users alike, with more units due to be ordered over the next twelve months, including the first shipments to Europe, the US and Asia. 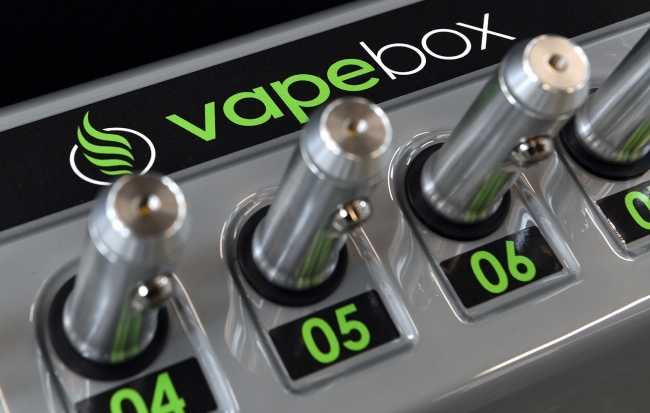 The Vape Box has been such an overwhelming success that it secured the Innovation Award at the prestigious Vapouround Awards, run by one of the sector’s leading B2B magazines.